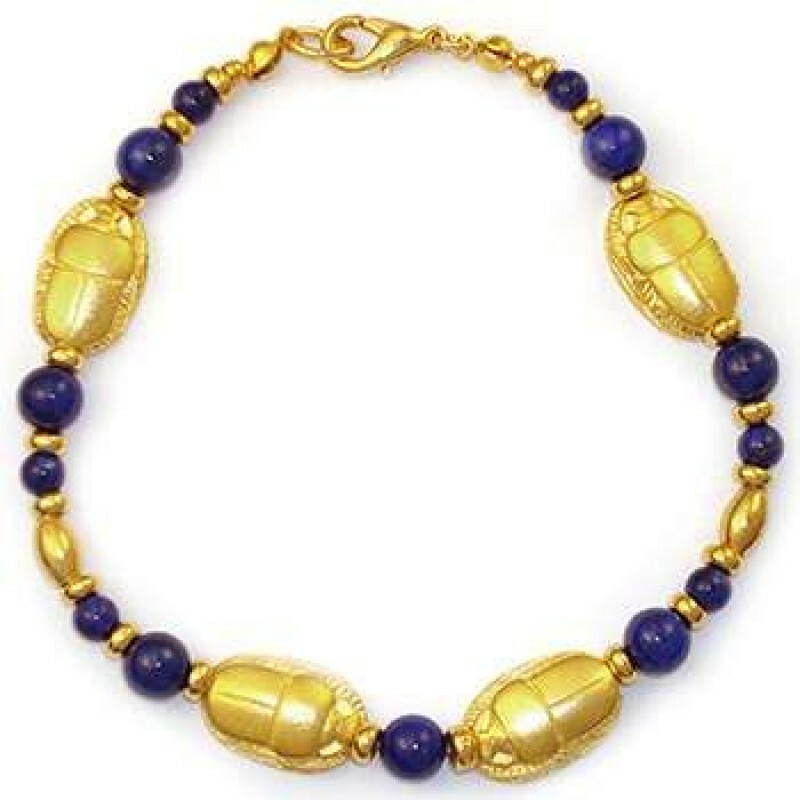 The ancient Egyptians attached great religious significance to the combination of lapis and gold and to the humble scarab beetle, a symbol of resurrection and eternal life. Regalia made of gold and lapis was believed to place the wearer under the protection of the sun and heaven. Gold was regarded as a divine metal relating to the ancient Egyptian sun god, Re. Lapis was thought to be a sacred stone, its celestial significance represented in the rich blue color of this stone. 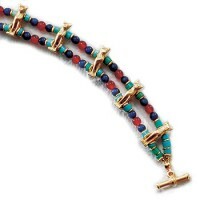 This lovely bracelet has gold plated pewter scarabs and beads hand strung with lapis lazuli. Bracelet is about 7 1/2 inches long with toggle clasp. Item Number: MR-427W | Approximate Size (Inches): 7.50 wide x 0.50 deep x 0.25 high | Approximate Shipping Weight: 0.25 lbs. Lapis Lazuli Lapis lazuli is a relatively rare semi-precious stone that has been prized since antiquity for its intense blue color. Lapis lazuli was being mined in the Badakhshan province of Afghanistan as early as the 3rd millennium B.C.E. Trade in the stone is ancient enough for lapis jewelry to have been found at Predynastic Egyptian and ancient Sumerian sites, and as lapis beads at neolithic burials in Mehrgarh, the Caucasus, and even as far from Afghanistan as Mauritania. It is deep blue with veining, usually in white, with flecks of gold and/or silver. Pewter Pewter is a malleable metal alloy, traditionally 85–99% tin, with the remainder consisting of copper and other metals. It has a low melting point and is very easy to cast in molds. It has been used since ancient times for everything from jewelry to table wear and was once called the "poor mans silver". Generally pewter has a grayish/silver semi-dull finish, though this varies depending on the metals combined with the tin and can be colored black or other shades or plated with gold or silver. All our pewter pieces are lead and nickel free. Pewter is generally hypo-allergenic and will not tarnish or react in most conditions. Note it can break or crack if flexed multiple times and rings cannot be re-sized, though interior ring springs or other adjusters might be used.